Gross domestic product (GDP) and per capita GDP (GDP/person) are closely related but give very different views of the economies. The per capita GDP tells us the income of individuals - loosely, how rich or poor people are - and is important for understanding the productivity and standard of living in the country. The GDP shows the overall size of the economy and is important for understanding the economic influence the country has on the world. A country can have a large GDP because the citizens are rich, the population is large, or both. The relationship between these variables can be seen at a glance in the figure above. 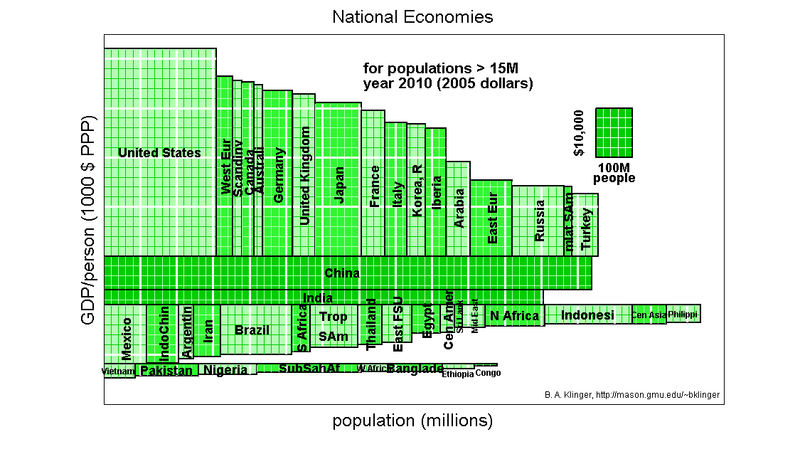 Each rectangle represents the economy of a country or a region. Width of each rectangle is proportional to population, height is proportional to GDP/person, and therefore the area of the rectangle gives GDP. The countries are arranged in the graph with GDP/person going from high at the top to low at the bottom. The figure shows the division of the world into high-income countries comprising about one billion people and 40% of global GDP, middle income countries constituting about three billion with another 40% of global GDP, and low-income countries with another three billion people and the remaining 20% of global GDP. The figure makes clear the large GDP/person gap between the richest countries and most middle-income countries. It is easy to see that China's large population is the main factor in giving it an enormous GDP; its GDP per capita is significantly larger than fellow population giant India but still less than half of the high-income countries. Brazil, Mexico, and Russia all have similar population and GDP despite vastly different geographic size. Many other patterns and relationships can be seen by studying the figure. 1990 Data shows modest growth in most countries, tremendous growth in China and (to a lesser extent) South Korea, and moderate growth in some other developing countries such as India, Pakistan, and Nigeria. How large and crowded states are. Population and per capita carbon dioxide emissions in order to compare responsibility and impact on climate change of individual nations. Population and Death Rate from Police Killings. Figure may be reproduced as long as credit to me appears with figure and I am notified (please send me a brief email with your name and a sentence describing how you are using it). I'd like to know if anyone uses this kind of graph with other quantities. Matlab program that generated the figure is available upon request. To the best of my knowledge the figures on this web page and others linked to here accurately reproduces the information used in creating them, but I take no responsibility for any damage resulting from errors in the graph.